Want to put your ideas and skills to the test? 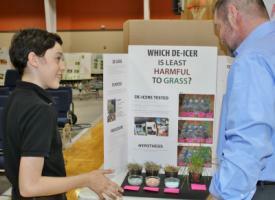 Join 4-H and Parkview Christian Academy for the 2019 community-wide Science Fair & STEM Showcase. Designed for individuals or pairs in 4th to 12th grades, participants may choose the demonstration option or the science fair option*. REGISTRATION OPENS FEB. 1! See registration section on the right side of this page ---> *The top Science Fair individual entries will win a Smart Speaker, donated by 4-H & PCA Supporters. If you are participating in this event, please review this packet carefully. Club youth will meet regularly to work with Vex kits and learn about robotics and technology. Click above link for more info! While no training dates are currently scheduled, this provides an overview of the 4-H Science Ambassador program and contact information. Thank you for your interest!